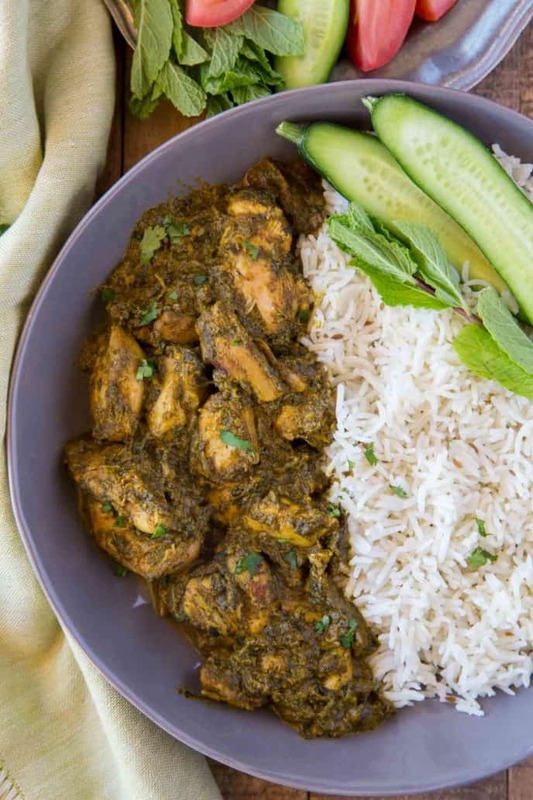 Chicken Saag is a classic Indian curry Chicken recipe with Spinach and cream that is stewed together until thick and creamy in under an hour. 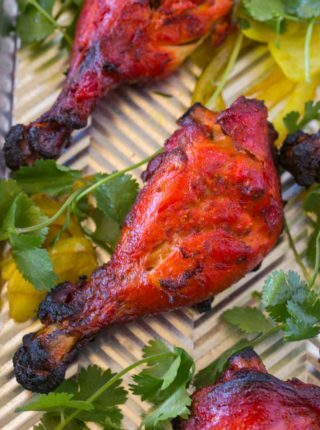 Indian Food is one of my favorite new sections on the blog, including favorite recipes like Chicken Tikka Masala and Easy Tandoori Chicken. I recently made Saag Paneer on the blog a few weeks ago and since then I’ve gotten a lot of requests for a chicken version. Good news was that I already had one ready to share and it’s absolutely delicious! What to serve with Chicken Saag? 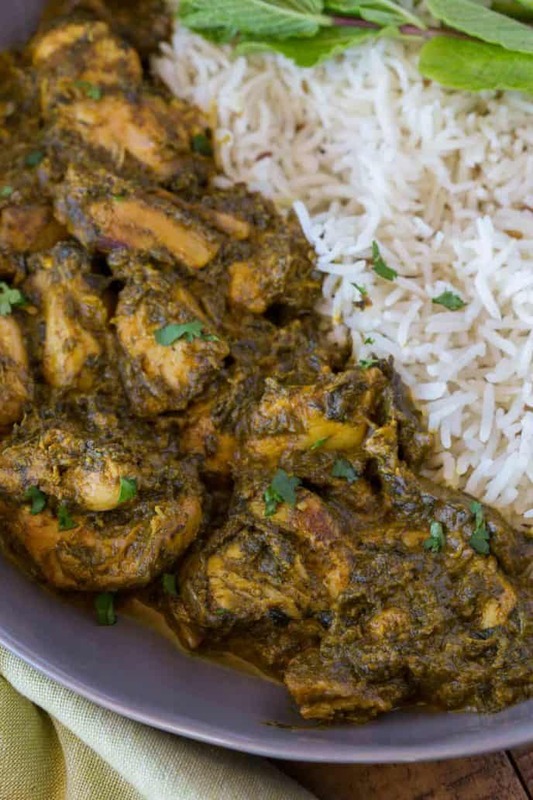 We love to serve Chicken Saag over cilantro basmati rice with naan bread. If we add a bit of heat from chilis then a cool raita also helps round out the dish. 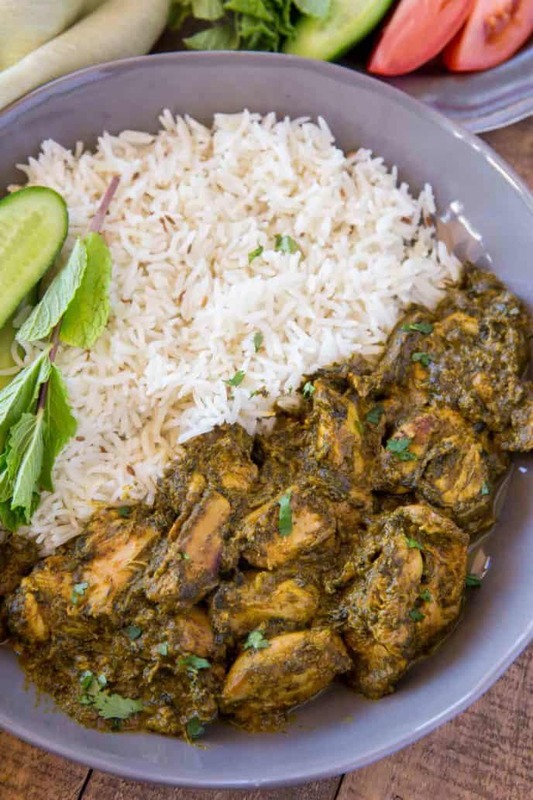 Can you make Chicken Saag in the slow cooker? Yes, once you’ve browned the chicken and onions, add all the ingredients (except the sour cream) into the slow cooker and cook on low for 5-6 hours. In the last half hour add in the sour cream, stir well and serve once the mixture comes up to a simmering temperature. Because of these delicious greens that are used in making saag, many people feel that saag is a healthy dish. Just remember we are also using butter and heavy cream, so there are still calories and fat in the dish. The greens are anti-inflammatory and full of fiber so this dish is an easy way to get veggies into the diet of someone who normally doesn’t like to eat vegetables. 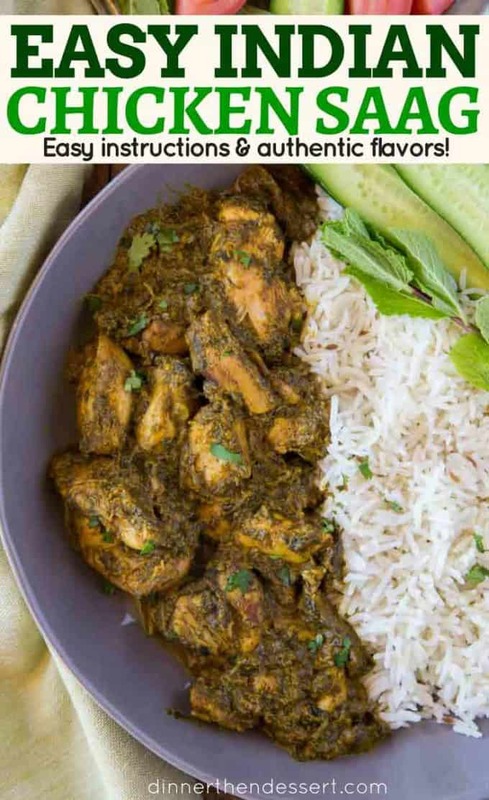 What kind of chicken is best in Chicken Saag? We use chicken thigh chunks in this recipe because the meat is sautéed then simmered along with other vegetables and spices and liquids. As chicken thighs simmer for 15-20 minutes they become more tender. If we used white meat chicken the chicken would become very tough and dry. Can you make this Chicken Saag vegetarian? 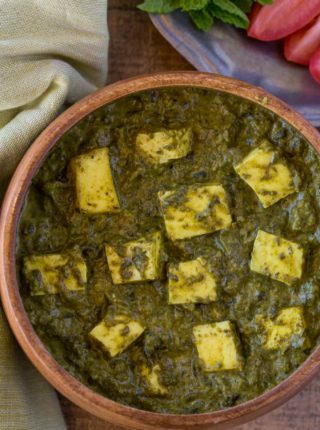 Yes, make my Saag Paneer instead! 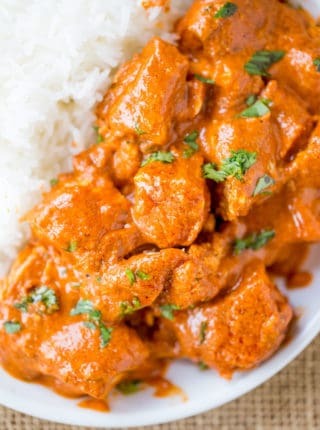 Looking for more delicious Indian Recipes? Add the ghee to a pan and sauté the chicken until lightly browned (no need to remove the chicken). Add in the spinach, cumin, garam masala, turmeric, cayenne pepper, kosher salt and heavy cream. Cook uncovered for 10-15 minutes or until the mixture has cooked down resulting in a thick green spinach sauce. Add in the sour cream, mix well together and just bring to a boil before removing from the heat. This recipe was delicious! I didn’t have ghee so I used butter instead. The family ate it so fast! My whole family who refuses to eat cooked greens just devoured this! Toddler ate like 3 bowls, shoving mounds of turnip greens into her mouth. ? I added the addition of cloves and mace, and I used half and half instead of cream because it was what I had on hand, and butter instead of ghee. Brilliant. I love when I see that the whole family enjoyed the dish! I know how hard it is to please everyone. Wow, this is so good! Just made it for dinner and I love it – creamy yet not greasy as I feared. As hard as it was to resist the urge to change the ingredients (it is a lot of fat lol), I’m glad I didn’t, especially for the first time making it. The only change I made was some fennel seed instead of fenugreek. I couldn’t find it at my local grocery store. Thanks for the great recipe! Hi Sabrina, I had the same issue as Chelsea. We went to three stores, including an Asian market, looking for fenugreek. The only thing we found was fenugreek powder made from the seeds, which is different than the leaves. In the end we decided to exclude the fenugreek completely. Do you have recommendations on where to find it? Also, where do you gi d heavy cream? All we can ever fi d is heavy “whipping” cream. Thanks! My wife and I are huge fans of your blog and we love your recipes! So sorry you had problems finding it. They actualy sell it on Amazon with a prime delivery if that helps. Also, when it comes to the heavy cream. I find mine at the grocery store but heavy whipping cream is essentially the same as heavy cream except the whipping cream is a bit lighter. 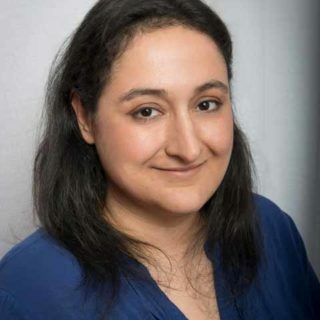 So glad you are loving the site! At what point do you add the spinach to the chicken? So sorry about that, not sure how that was deleted. The spinach will be added back in during step 5. Hi, the recipe calls for fenugreek, is that in seed form or ground up? I used dried fenugreek leaves. Hope this helps! Hi Sabrina, first I’d like say thanks for slow cooker butter chicken. It has become a family favorite!! About the fenugreek, is the ground seen significantly different from the ground leaves? Since the recipe didn’t specify, I didn’t realize that there’s a difference. What I bought from Whole Foods is actually the ground seeds and not the leaves. Will it change the taste drastically if I use the ground seeds? Using seeds will drastically change the flavor of the dish. If you decide to still use them, do not overheat them as they will turn out very bitter. Do you add the chopped spinach at the same time as the garlic, onions, and ginger (after the chicken has been browned)? This sounds like a mouth watering dish. My husband and I are crazy about Indian food! 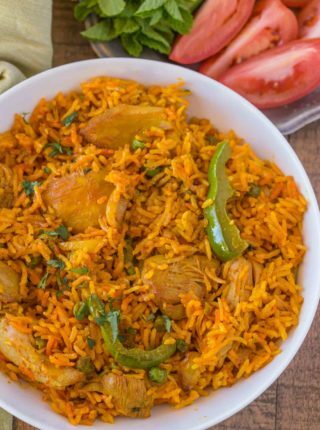 We can’t wait to try this recipe! Cant wait to try it. But at what point do you add the chopped spinach? You’ll want to add the spinach back in with the cumin, garam masala, turmeric, cayenne pepper, kosher salt and heavy cream. Thanks for letting me know it was missing. I had no idea it was this easy! I am totally going to try this soon. This looks really tasty! I will definitely try this! 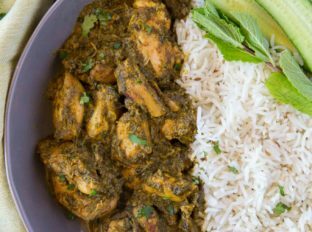 I love good chicken saag but have never tried to make it at home – can’t wait to try this recipe!